At the Yuba City Dentistry Group, we are committed to preserving your natural teeth and keeping them healthy. Unfortunately, there are times when a tooth has sustained too much damage to be repaired. Tooth extraction is typically a very routine procedure. Although your particular situation will affect the approach, you needn’t have any fear. Remember that a tooth is not rigidly fixed into the bone; it is actually attached to the bone via a network of fibers known as the periodontal ligament. A skilled hand will carefully manipulate the tooth, detaching the fibers and freeing the tooth without much trouble. That being said, extracting a tooth is still considered minor surgery. Let’s take a look at what’s involved. Your dentist or oral surgeon will first take an x-ray to assess the position of the tooth, its roots, and the condition of the surrounding bone. This helps them to plan the best way to remove your tooth and anticipate any possible complications. Your doctor will also review your medical and drug history at this time, and discuss options for anesthesia. He or she may prescribe antibiotics to be taken before and after surgery, depending on your circumstances. On the day of the procedure, you should wear short sleeves (or sleeves that can be rolled up easily). This allows easy access to a vein in the case you will need intravenous anesthesia. Make sure not to eat or drink anything for at least six hours before the extraction. Let your doctor know if you have a cold or cough the week leading up to surgery. If you experience nausea or vomiting the evening before your procedure, call your doctor in the morning. The extraction may need to be rescheduled, or the planned anesthesia may need to be changed. Do not smoke the day of your procedure. This increases risk of a painful condition known as dry socket. Also, plan for someone to drive you home and stay with you following your procedure. 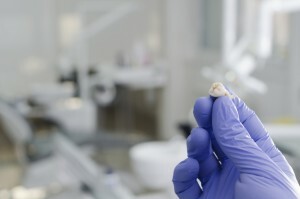 A simple extraction is performed when the tooth is clearly visible. Your dentist first loosens the tooth with an instrument known as an elevator, and then uses forceps to remove the tooth. A surgical extraction is more complex. An oral surgeon or dentist will perform this procedure when a tooth is not yet visible or has broken off at the gum line. The doctor first makes a small cut into your gum. He or she may then need to remove some of the surrounding bone or cut the tooth in half before extracting it. In both cases you will most likely receive local anesthesia; however, additional sedatives are also available in case of complex or multiple extractions. Steroids and other medications may be used to reduce swelling and pain following the procedure. You shouldn’t feel pain during your extraction, only some pressure as the doctor removes the tooth. If you experience any pain, tell the doctor right away. Extracting a tooth is surgery; thus, it’s normal to experience some discomfort, even following a simple extraction. Surgical extractions may cause more pain, depending on how long the procedure lasted and how difficult it was to remove the tooth. In either case, your doctor will probably direct you to take anti-inflammatory drugs (such as ibuprofen) to manage symptoms. Before heading home, you will receive detailed instructions from the doctor. Make sure to follow these and ask questions if you don’t understand something. Once home, you can use ice packs to further reduce swelling. Leave them on the affected area for 20 minutes, then remove for 20 minutes. Repeat as needed. Try eating softer foods for the first couple of days, then try other foods as you feel comfortable. After just a few days, everything should be back to normal.